.......53 Buddhas and Me .................My Life Adventures.....: Rainbows Make Me Smile. It is very humid up here in Far North Queensland, so waking up to the sound of rain is quite refreshing. But this morning it was not only the rain to enjoy but it was also looking out the window and seeing this beautiful “rainbow” across the skyline. We all know that the rainbow is made by the diffusion of light and water or something like that anyway, but to me I feel there is something much more spiritual about the multi coloured arch. Rainbows have always bought a smile to my face, I never know why, they just make me feel good and at peace with my place in the world at that very point in time. This morning was no different, but I also felt this morning that this rainbow had some sort of connection with my revelation after walking through the bush with Willie Gordon on Thursday. As I mentioned yesterday, while on the tour with Willie we visited the birthing cave for the past Aboriginal woman. While in the cave I once again felt that calmness that all was right in my world at that particular time. Today’s rainbow instantly transported me back to the cave. Why you ask – The name of the cave was the “Rainbow Serpent Cave”. That rainbow connection is enough for me to know that all is good with my life at this present time. dinner with Shane and Stacey. Beautiful rainbow photo. Your spiritual encounter in the bush is wonderous. You have been truly blessed. 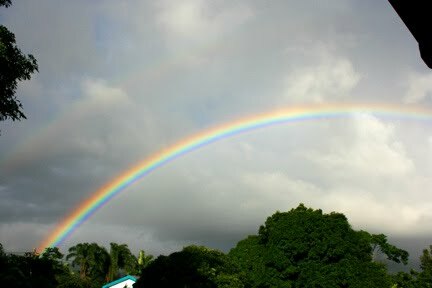 Wow Davine, what a fantastic rainbow photo. Please forgive me, I didn't read your writing tonight, I'm darn near sleeping at my computer and have to just back away slowly and go and rest my eyes. I'll get back to you here once I get some sleep! Cheers, have a wonderful day! Hugs sent to you from across the many miles!